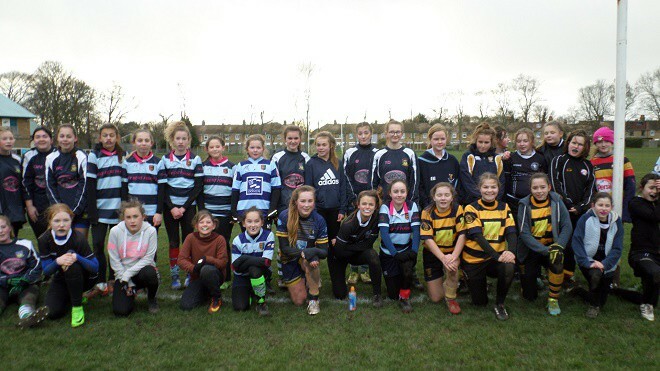 More than 40 girls, aged 12-14, enjoyed an afternoon of rugby at Thanet Wanderers last Sunday (January 27). The girls came from all the ‘Channel’ clubs, Deal, Dover, Folkestone and Thanet and were joined by others from Sevenoaks and Ashford. Clubs in East Kent each have a few girls in the age groups, so it’s beneficial to meet up and have training and games together. The wind was very cold and there was sleet in the air, but the experienced coaches kept the girls moving and focused the whole time. In the skills-based section the girls learned extreme handling, slick passing and later, contact with the ground and tackling. They were then split into four equal teams for a Touch Rugby tournament where these skills were put into practice. Players were split up into their own age groups for full contact rugby, where they experienced line out and rucking in the game situation. There were some outstanding displays of proper rugby at this level with some ferocious tackling and great continuity. After the matches, the girls, muddy and tired, enjoyed the ‘après’ rugby social in the clubhouse together and voted Rugby Union the winner. The club thanked everyone for coming and wished the players all the best for matches next week against Tunbridge Wells. Some under 15s will have a rest week while the more experienced players will have assessments for the County Squad. For more details about girls’ rugby please contact Maggie Watts, 07990 947042 or go to the Thanet Wanderers Website: www.thanetwanderers.co.uk/ and go to the Girls page.